Initial thoughts: Love this bag! The most surprising hing is....no stinky bag!! I don't know if it is because it is mesh, but the bag smelled great this time. The Buxom lip polish is amazing and it is plumping. I ran out of my plumping gloss months ago and have been looking for another substitute (it was a weird brand that I have to order online), and this is perfect. I don't have dry hair, but I am curious to try the Nu-Me since I have heard so much about it. I love Juice Beauty and the green apple smell of this moisturizer is so addicting. I think I could smell the tube all day long. Facial Towelettes are always necessary and I have been curious to try the Yes to Cucumber ones. Circus nail color...hmmm...not sure what to think. It comes in a cool (but wasteful) container. The actual bottle itself is heavy on glass. The color...yuck. Not me. I think my Mom will like it though, so I sent it to her. 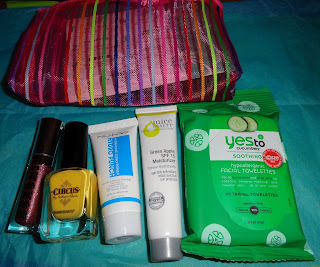 Overall, very satisfied with this bag and anxious to use all the products. *You get bonus points for answering short surveys about the products you receive. You can then use those points to buy products at the their store (i.e. : FREE Stuff!). 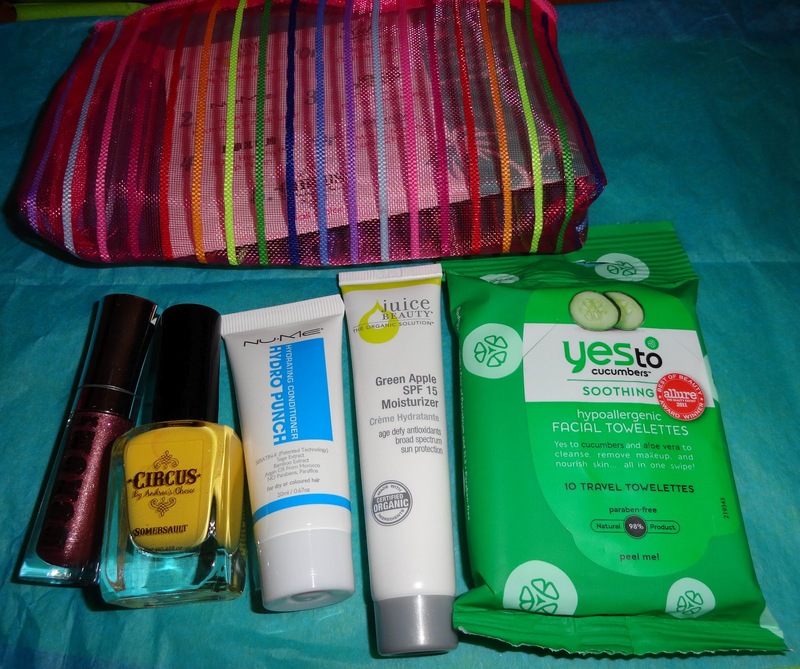 This month's winner: For the second month in a row, MyGlam had the higher value bag (although that is debatable depending on the value of the Earbuds), but Birchbox is my winner. I love both boxes, but Birchbox had more useable products and more products I would be likely to buy (boscia, stila, even the Tea Forte). Plus, I really loved the Earbuds. Best bonus product so far! The Buxom is probably the only MyGlam product I will buy. Disclaimer: I purchased both boxes with my own money, I just do these posts to share my goodies. I am not compensated in any way. GREAT POST!! Ah I love this so much because I was debating making the MyGlam switch. I think this month's Birchbox was a surprise because the last few months have been horrible...this month was a huge surprise. I didn't realize Myglam came in a makeup bag..how cool. I also didn't know Birchbox was made by Harvard grads. Interesting!! I've never seen the MyGlam! How cool! 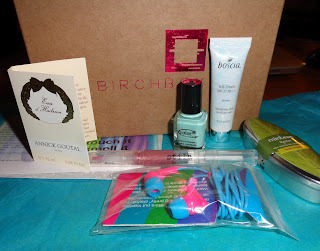 I've really liked my Birchboxes though...maybe I'll sign up for both! The myglam bag seems so cool! I really like everything you got - I might have to try this out! That lip glaze is worth more than 4 dollars. I have the same size lip glaze from Sephora and they retail for 16. I have heard so much about both boxes but I have not broken down and ordered yet. I think I might go for the MyGlam box! How fun that you get both boxes and compare them! 1. 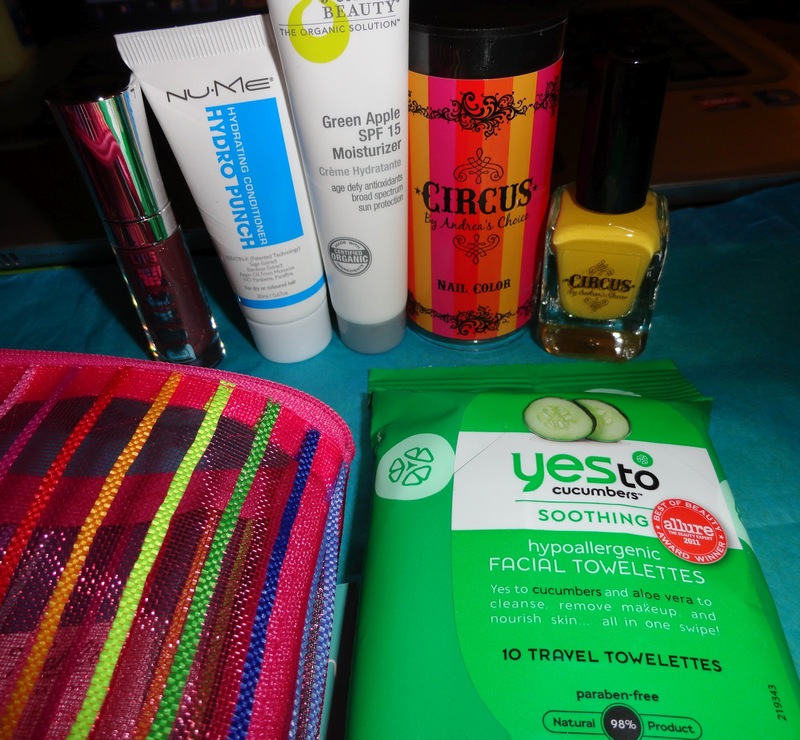 I love the "yes to" facial wipes. I got them in my birchbox a few months ago and found them at Target. 2. I am super jealous that you got two nail polishes this month. I have been wanting to try a yellow out. this myglam looks pretty good, but i'd still prefer to get the birchbox products. I'm with Tara. I've been debating getting both, but still going to stick with Birchbox. Great review lovely! I just signed up for My Glam, so I hope they stick to doing better!! I'm jealous of your nail polish in your birchbox, I didn't have that included. I've never heard of My Glam, but I might have to look into it. I've been thinking about subscribing to Birchbox for awhile now, but My Glam looks like it has a better value. Don't know yet, though. Will have to investigate!